The burning of fossil fuels to provide energy for buildings is a major component of global GHG emissions, driving climate change. Sustainable design conserves energy while improving building performance, function, comfort, and enjoyment. This month, the AIA COTE will explore energy-efficient design ideas, including passive design strategies and active systems and technologies. To kick off the conversation, Constance Bodurow, Founder and Director of Detroit-based, WBE studio[Ci] LLC will present The Seebaldt Pilot (TSP), a pioneering Detroit based energy-cooperative project. The project is the result of a multi-year collaboration with the Detroit 48204 community which has resulted in a shared neighborhood vision to create a sustainable future by incorporating a unique solar technology and establishing an energy cooperative to deliver energy, education and empowerment to LMI residents. Through design agency, we are leveraging the once in a generation opportunity to both affordably acquire and activate concentrations of publicly owned (DLBA) vacant parcels for generative infrastructure (energy. water. food. waste. and mobility) and institute renewable systems (workforce development, empowerment, education, culture, and economic development). In 2017-2018, TSP was awarded a US Department of Energy Solar in Your Community Grant, a MAE/MEO Event Sponsorship Grant, and two prestigious LafargeHolcim Foundation design awards. 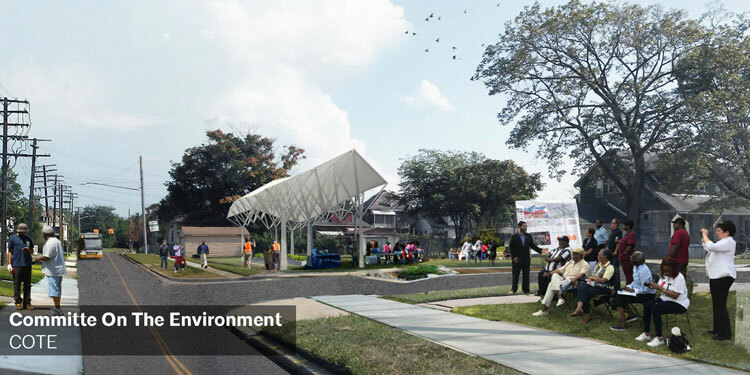 These recognitions facilitated design and engineering, implemented a canopy prototype and community gardens, supported OBR monthly meetings and quarterly community events which raised awareness and expanded advocacy. and created a community space at 5005 Seebaldt, site of the HNZE prototype, gardens and many informal and formal community gatherings.